Then your core might actually be shot. I should have pointed out that I can take both hoses off at the core, and there is no flow. The inlet to the core has a slightly warm trickle, as if one turned their sink faucet on as low as possible. I was thinking maybe an auxiliary pump is out, I have read on other threads about it? I ordered a Bentley manual, I'm waiting for it's delivery. I recently bought a 2000 v6 and when I test drove it, I swear it had heat, but it was 90 degrees outside, so maybe I missed it. Anyways, I have no heat. So I decided to start with the CLR flush method, and did indeed get some minor flakes and stuff out. But I doubt that was the problem, since it seems to flow pretty good with the garden hose to it. I put the hoses back on, and tried to bleed, but no coolant comes out near the core, so I pulled the hose completely off, and no matter what, coolant is not coming out of the return pipe with the engine running. Also probably related, the electric fan is on if the car is on. Shouldn't that only come on if the coolant is hot? I figure it may be the temp sensor for the fan, but what about the no coolant at the core? The temp gauge reads right in the middle after about ten minutes, but the oil temp seems like it takes a long time to come up, like 20 minutes. Ian, your car and my car sound like they have the exact same problem, although my electric fan doesn't come on immediately when I start the car with the engine cold. Does yours? Anyway, I have the SNO-BOL but haven't done the flush yet. It was raining here this weekend, so I decided to postpone until a nice day. Should be sometime this week. My electric fan comes on within a minute or so of the car being started, and shuts off with the ignition. Should the after run pump be on while the engine is running? Is that relevant? You got me, I don't even know what the after run pump is. I'm gonna do the flush this weekend. It's going to be sunny and in the 60s here. Alright, I performed the SNO-BOL flush on the heater core today. I got mixed results. During the flush process, I got zero, nada, zilch flakes of anything out of that heater core. Which makes me believe, that since the heater core only has 40,000 miles on it, that it is not plugged. The good news? 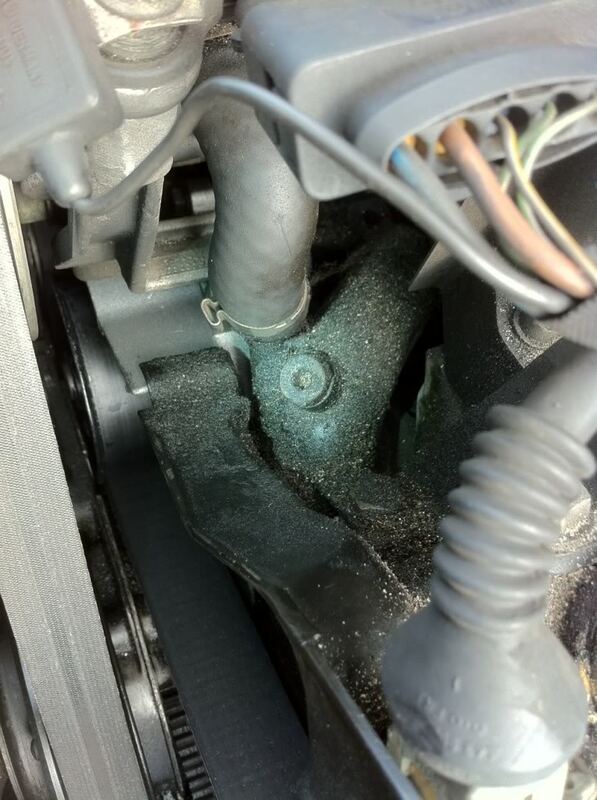 I was able to get rid of an air bubble in my coolant system and I was able to visually see coolant streaming out of the vent hole in the output hose on the heater core, thus proving I have flow through the heater core. I am now back to where I was last year, perhaps even a little better. I have lukewarm heat at idle when the engine is at operating temp. At higher revs, around 2,000 rpms, I've got good, HOT heat. That being said, since I still don't get strong heat at idle, I still believe I have a problem. I'm going to talk it over with my Audi mechanic tomorrow, but I thought I'd let everyone know where I'm at in this battle. Does anyone know if there is indeed something called a "secondary coolant pump" on the 2.8L AHA engine? I couldn't find anything called that in the Bentley guide. There was one guy over on Audi World who claimed his was bad, but I've never heard of that before, nor have I heard of anyone else who has had a bad one. The last page of the cooling section in the bentley manual has the pump. I bled my system over the weekend, and that seems to have helped, along with running the heater in econ mode so the electric fan stays off. The coolant bleeder screw for the 2.8 AHA is right..... HERE! Yes, of course it is! I don't know why I couldn't find it earlier. I found it on Sunday when I did the heater core flush, and the screw was very easy to find. That being said, mine was kind of dirty and I couldn't tell which kind of head it had, so I tried a T30 bit, and that got stuck in there while I was trying to open the bleeder screw. So I stopped trying and had to yank the bit out of there with a pliers. Anyway, since I already had flow thru the core, I left well enough alone and didn't try a hex bit on the bleeder screw. Ian, do you know by chance which bit should fit? Torx or Hex? I spoke to my Audi mechanic today, and he said that since I'm getting good heat at high revs and little heat at idle, that's a definite sign of more air in the system somewhere. He told me to keep burping it and I'll eventually get good heat at idle. He also said that the secondary coolant pump is only used when you turn the engine off. It turns on when the engine turns off, and circulates coolant through the system to keep the engine from overheating. So it's a non-factor in producing heat when the engine is running. I'm pretty sure it was a torx. Don't remember the size though.